The University of Technology Sydney (UTS) is using its new Frank Gehry designed Dr Chau Chak Wing Building to promote the UTS Business School. 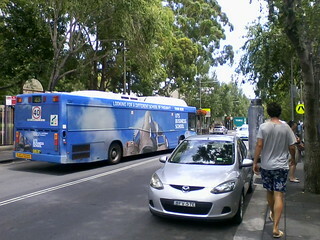 This includes an advertisement on the side of a NSW bus. I am nots ure what the architect would make of his work being used in this way, but this is in a long tradition of universities using architecture as part of their branding. The Great Dome of Massachusetts Institute of Technology (MIT) is used in stylized form by many of MIT's units, such as the Schiller Lab.